Marco Cesarano knows the field of computer science is constantly evolving and if he wanted to keep his skills current, he would have to take advantage of opportunities to improve his skills and knowledge. When he saw an advertisement at the National Council of Research in his hometown of Naples, Italy for UC Irvine’s Master’s in Information and Computer Science with a Concentration in Embedded Systems, he knew he found an avenue that would allow him to take his skills and knowledge to the next level. The unique Master’s program provides students the opportunity to study for two five-week sessions in the United States at UC Irvine during the summer and for three quarters at the Istituto di Cibernetica Eduardo Caianiello in Naples, Italy. In addition to courses, students work on embedded system research projects as part of their thesis and can obtain a Master’s degree in as little as 15 months. Cesarano’s research project focuses on system virtualization, the possibility to run different operating systems, and different runtime environments, on the same hardware. “This has many implications for traditional systems, for example to consolidate different applications on the same server, saving a lot of money; but also for embedded systems, to enhance the security and the isolation between different modules, making it more simple to debug them,” Cesarano said. Cesarano misses his family and friends while studying at UC Irvine, but feels it is worth the time away in order to acquire the knowledge and skills needed to fulfill his career goals. Cesarano found the on campus apartments in Verano Place, one of three campus communities for graduate students, beautiful. An avid naturalist, Cesarano enjoys walking through Aldrich Park and soaking in the 19-acre botanical garden in the center of the campus with more than 11,000 trees and shrubs. 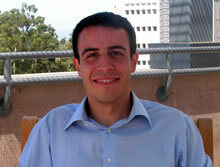 Cesarano will finish his thesis and obtain his degree in September of 2008 and plans to continue his academic career at UC Irvine, as a Ph.D. candidate or researcher. “Even though embedded systems is a huge field, with numerous applications, a Master's in Embedded Systems provides the broad understanding and methods necessary to deal with them,” Cesarano said.